Bring 200g of water to boil. Weigh out 15–18 grams of (depending on your preferred strength). Grind to a texture slightly finer than sea salt. Place a paper filter in the AeroPress’ detachable plastic cap. Use some of your hot water to wet your filter and cap. The water serves a dual function here: It helps the filter adhere to the cap and heats your brewing vessel. After wetting filter and cap, hold the cap by its “ears” and the water very slowly so it can be absorbed by the filter. Assemble your AeroPress. Make sure the entire assembly is dry, since any residual moisture can compromise the seal of the device. Add twice the weight of water than you have grounds (e.g., for 15 grams coffee, add 30 grams water). The water should be about 90-95 degrees. Make sure the coffee is saturated evenly, stirring it with a wooden spoon, or stick if necessary, and let it sit for 30 seconds. Fill the chamber with the remainder of the hot water. After about 30 seconds, stir the grounds 10 times to agitate. Fasten the cap while ensuring that it locks into the grooves tightly. Flip the whole assembly over with swiftness and control. Position it atop your brew vessel and begin to apply downward pressure. You will experience about 30 pounds of resistance here. If the pushing feels too easy, your grind is likely too coarse; if it is very hard to push, the grind might be too fine. Your coffee is fully brewed once it begins to make a hissing sound. This means there is no more water to push through the device. 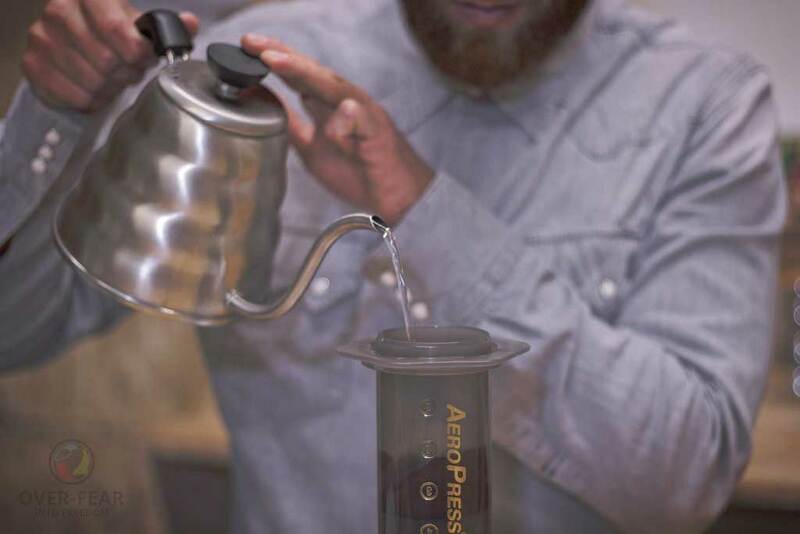 Once you have unscrewed the cap, you can pop out the filter and the puck of condensed grounds by simply pushing AeroPress’s interior section a final inch.